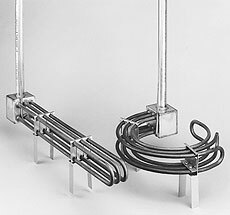 These over-the -side immersion heaters are designed for installing in the top of a tank with the heated portion directly immersed along the side or at the bottom. This provides easy removal of the heater and ample working space inside the tank. in (cm) Straight Elements Curved Elements Wt. Clearance (B)--in (cm) Model No. * Designate voltage, i.e. insert 240 for 240 for 480V for 480 V.
** Add the suffix “3P” to the model number for 3 phase power. Optional thermostat kits are available to fit into heater terminal box.